Jonas Mekas (1922–2018), tireless advocate for the underdog, was without a doubt the world’s foremost advocate for personal/underground/avant-garde cinema. As a poet, publisher, filmmaker, curator, critic, archivist, rabble rouser and hopeless romantic, his cultural influence cannot be underestimated. 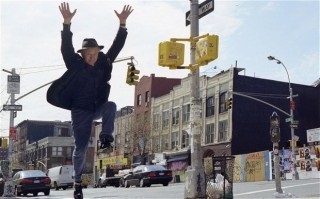 Born in Semeniskiai, Lithuania, Mekas emigrated to the U.S. in 1949 (after imprisonment in a Germen labor camp and life in a displaced persons camp), fell in love with New York City and immediately took to filmmaking, a practice he maintained to the end of his life, eventually pioneering the personal diary into an epic film genre. By 1955 he was co-publisher (with his brother Adolfas) of Film Culture, a journal articulating the aesthetics of underground cinema which was published quarterly until 1995, while his Village Voice column “Movie Journal”—which ran 1958–1978—presented weekly updates on the New York underground scene of the day while cultivating community and bracingly attacking mainstream cinema. A visionary infrastructuralist, Mekas’ establishment of the Film-Makers’ Cooperative (in 1962) and Anthology Film Archives (in 1970) ensured that underground and personal film would be preserved and cherished for generations. In this screening San Francisco Cinematheque and Canyon Cinema celebrate the life of Jonas Mekas with a special screening of his 1997 film Birth of a Nation (1997): 160 portraits/appearances, sketches and glimpses of avant-garde, independent filmmakers and film activists, filmed 1955—1996, a celebration of Mekas’ artistic community and adopted homeland. List of filmmakers and related friends and film activists who appear in the film, in order of appearance: P. Adams Sitney, Peter Kubelka, Ken Kelman, Hollis Melton, Ken Jacobs, Larry Jordan, Florence Jacobs, Harry Smith, Henri Langlois, Annette Michelson, Gerald O’Grady, Hollis Frampton, Sidney Peterson, James Broughton, Joel Singer, Stephen Dwoskin, Dore O., Werner Nekes, Kenneth Anger, Andrew Noren, Jacques Ledoux, Ed Emshwiller, Saul Levine, Larry Gottheim, Pascale Dauman, Ray Wisniewski, Taylor Mead, Michael Snow, Ricky Leacock, Stan Brakhage, Jane Brakhage, Barry Gerson, Willard Van Dyke, John Whitney, Pola Chapelle, Morris Engel, Stan Vanderbeek, Amy Greenfield, Bruce Baillie, Chantal Akerman, Sally Dixon, Will Hindle, Michael Stuart, Robert Creeley, Friede Bartlett, Scott Bartlett, Jud Yalkut, Adolfas Mekas, Callie Angell, Charles Levine, Bhob Stewart, Nelly Kaplan, Claudia Weil, Annabel Nicholson, Birgit Hein, Piero Heliczer, Peter Gidal, Kurt Kren, Wilhelm Hein, Malcolm Le Grice, Carmen Vigil, Bill Brand, Regina Cornwell, Akiko Iimura, Taka Iimura, David Crosswaite, Gill Eatherley, Amy Taubin, Tom Chomont, Peter Weibel, Carla Liss, Robert Huot, Guy Fihman, Claudine Eizykman, David Curtis, Barbara Rubin, Kenji Kanesaka, Anna Karina, Leo Dratfield, Gregory Markopoulos, Robert Beavers, Robert Kramer, Pamela Badyk, Cecille Starr, Jerome Hill, Donald Richie, Fred Halsted, David Wise, Sheldon Renan, James Blue, Ernie Gehr, Richard Foreman, Robert Polidori, Leni Riefenstahl, Amalie Rothschild, Lillian Kiesler, Shigeko Kubota, Jerry Tartaglia, Dan Talbot, Louis Marcorelles, Michel Auder, Dwight MacDonald, Viva, Leslie Trumbull, Kit Carson, Paul Shrader, Shirley Clarke, Bosley Crowther, Dimitri Devyatkin, Ulrich Gregor, Sheldon Rochlin, LaMonte Young, Robert Gardner, Vlada Petric, John du Cane, William Raban, Tony Conrad, George Maciunas, Alberto Cavalcanti, Jim McBride, Peter Bogdanovich, Gideon Bachmann, Christiane Rochefort, Jerry Jofen, Rosa von Praunheim, Hans Richter, Roberto Rossellini, Lionel Rogosin, Robert Haller, Storm De Hirsch, Marcel Hanoun, Jerry Hiler, Bruce Conner, Myrel Glick, Paul Sharits, Barbara Schwartz, Lewis Jacobs, Ian Barna, Carolee Schneemann, Anthony McCall, Diego Cortez, Leslie Trumbell, Adolfo Arieta, Louis Brigante, Coleen Fitzgibbon, Stewart Sherman, Charles Chaplin, Len Lye, Tati, Allen Ginsberg, Valie Export, Hermann Nitsch, Andy Warhol, Jack Smith, Analena Wibom, Robert Breer and Raimund Abraham.